A week or so ago JimG had emailed me to ask me if I wanted to get a new Pencam camera, sure why not. 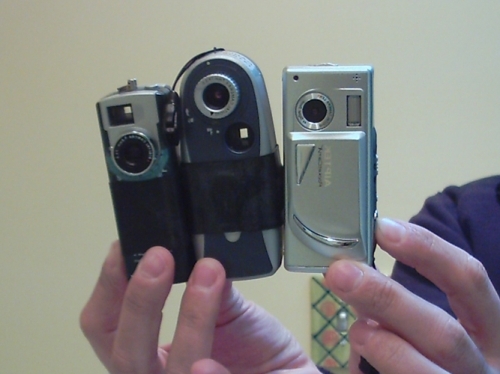 I have been using the Pencams for about three years to shoot photos during bike rides. In fact probably 99% of the photos on this website were shoot with one. I picked up the Pencam X camera (most right on the photo) and next morning went on a ride on a sunny day. Shoot a bunch of photos during that ride. Came home plug the USB cable that came with the camera into the old Powerbook and bam! iPhoto opens and recognizes the camera, no software installation needed. This is a first for a pencam, they always required third party software (macam) to work on Macs. Also last week I asked JimG him if I could borrow his Airport Express (AE). I been thinking of buying one but wanted to test them before purchasing. This is an Apple gadget that can be used, among other things, to stream music from your computer to your home stereo or self-powered speakers, Mac or PC it does not matter. I have a huge collection of music on MP3s that I've been wanting to put to better use. Picked up the AE and next day I spend a good 2 hours trying to make it work with no luck. I finally decided I would try to set it up connecting it directly to the router instead of trying to use the Powerbook's wireless connection. Once connected directly to my router, a non-Apple product by the way, via a regular cat5 (network) cable and added the AE MAC address to the router configuration it was a breeze to complete the process, 10 minutes and I was up and running. Oh yes in order to work with wireless stations/routers that are not Apple branded you'll need to set the AE to "join an existing network" (client mode.) Tested the connection while I was still connected via cat5 cable to the router and then unpluged the whole thing, moved to the living room the final home ot the AE, connected the AE to the home stereo with a cable I got from Radio Shack ($13, Catalog #: 12-2057), waited for the green light to signal we were good to go, fired up iTunes on the computer, selected the speakers I wanted to used (Living Room) and songs came out through the stereo speakers, cool. Yes my MP3s are not all recorded at a great bit rate as I try to fit many songs in CDs I burn for listening at work so the quality of the sound is not as good as my original CDs but hey, I can do things with iTunes I can't with my regular CD changer plus this is a good option for having background music like when we have people over (not to often) or just when I'm sick of the ever uninspiring radio programing stations do. I listened to some music that day and by the evening I decided it was worth getting my own AE. Craigslist crawling, a couple of emails sent to unresponsive sellers and went to bed hopping I could find a used one next morning. Right before going for a ride I checked Craigslist again and there it was, a new listing for an AE, emailed and got a response within minutes. I picked up the AE on my way back from my ride, $50 in perfect condition with the original box, and all "materials" inside. I rode home happy. An easy setup followed using the saved configuration of the AE I had working, and again I was up and streaming music to the stereo in minutes. Cool toy and cheap too.